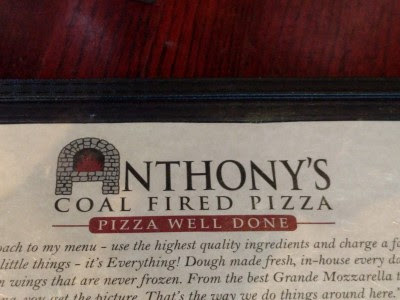 The last time went to Anthony's Coal Fired Pizza was May 2013. At that time, we were not impressed. My recollection is somewhat pricey, salty, charred pizza and disappointment. Since then, we have avoided returning. But then one day we went to see a movie, and then we wanted dinner, but we wanted to just walk to dinner, not get back in the car & drive, so I reluctantly agreed to return to ACFP. I am very disappointed that ACFP does not serve fresh brewed iced tea. They serve that crap from a soda fountain, the crap loaded with the same crap in soda. Since I don't drink soda or fake iced tea, and since I didn't want to drink alcohol, I stuck with tap water. So did SP. I really didn't know what to get. In the end, we both opted for the $10 personal meal - a salad and either 5 wings or a personal pizza. 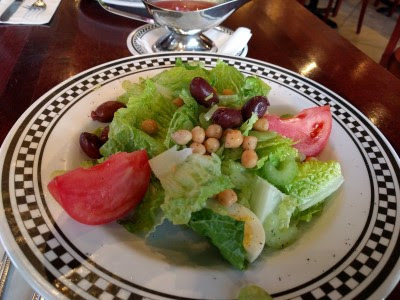 The salad was pretty large, mixed greens, chickpeas, kalamata, tomato. 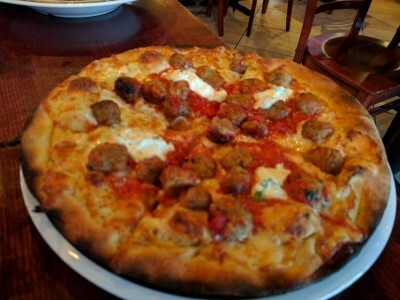 I got the Meatballs & Ricotta Pizza. It was pretty good. Lots of mini meatballs that were not overcooked/hard, which is what I expected form tiny meatballs on a pizza. I took half of it home for lunch the next day. 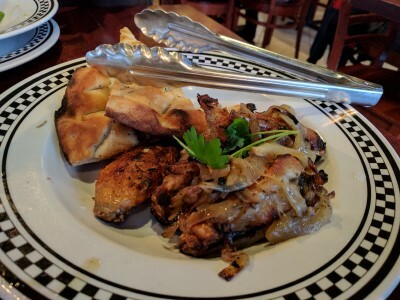 ACFP was better than I expected, better than our last visit, but the lack of fresh iced tea was disappointing as was the service. Our server didn't check in with us after we got our food, didn't ask if we wanted dessert, simply dropped off the check. She didn't seem interested in us, perhaps because we weren't ordering more expensive food and alcoholic beverages (and again servers need to keep in mind that some people just don't like or cannot for medical reasons drink alcohol). I'd go back to ACFP for this deal because the salad was a decent salad and for $10/person plus tax & tip, it was a good deal for us at an early dinner time. But if I'm in the mood for pizza, I'll stick with Mercurio's, Pizza Milano, Cucina Bella, Piccolo Forno.